Can I show SWF FLASH files on my Site directly? I just see the option to get a link to a upload file, but I want to show a swf presentation in my home when people gei into my site. The first thing is to upload your .swf file. You can do this from the Site menu -> Manage Files. Then you just need to substitute "myswffile.swf" in the code above (in both places) with the name of the file you uploaded and you should see the Flash movie appear when you close the HTML widget editor. You'll need to play around with the width and height values in the text above to suit your movie's size. It worked. Wonderful! One small issue, it came in with a large White background that not part of the flash page. Changing the size and height also changes that unwanted white background. Any thoughts? See http://www.keyehcom.synthasite.com/ view the "card-free international call" page. gamedemon, it worked like a charm. Wow! This thing is getting real good. Thank you so much. I thinks this is one of the better ways to embed presentations 'cause free online services have a lot of Banners. The page labelled index in your site manager is the one that your readers will land on when they arrive at your site. So you may wish to put your flash onto that and then you can direct them to where you wish them to go. Have I misunderstood your question? yeah i think u have misunderstood the question . u must have senn websites which opens with the flash intro page nd den redirects to the home page . I'm not sure this is possible with our site builder, but I'd be happy to be corrected if there are any SynthaSite users out there who have managed to do this and would be happy to share how they did it. Ruth is correct. 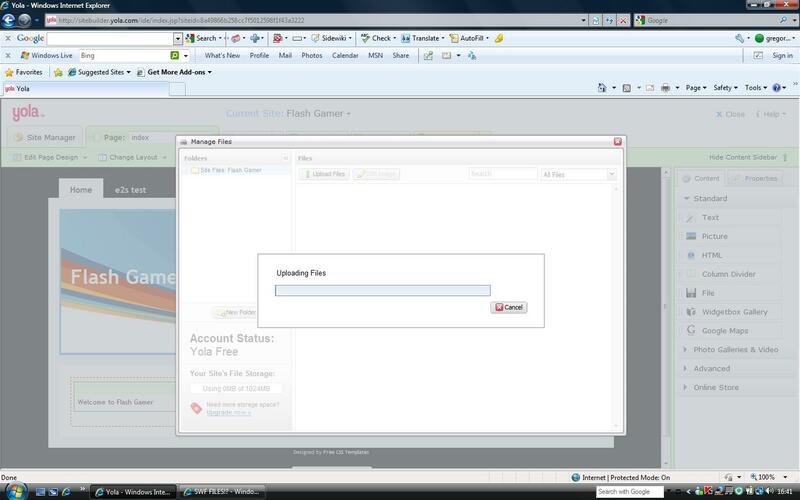 It is possible to embed a flash file on your page. But it is not possible to have a flash page created with SynthaSite that opens prior to your index page that does not use one of our templates. I will pass on your request to our developers so that they can decide whether we can develop such an option in future. Thank you for your request. We like to hear what our customers would like that is not presently available, as this helps us with our planning. I love the FREE service / product that synthasite offers. It would be awesome if there were an option to have a flash intro page before having visitors be directed to the "home" / index" page. So basically it would amount to having a blank first page for the synthasite user to use however they want, and whether this should display the menu or not... that might be the easiest way to implement it. Thanks Vez - I'll forward it for consideration! You can change the size by editing the width and height numbers so that it's your required size. Hope that helps! I can't place the html code in the banner section of the site. Is it possible to have a flash banner? I tried to embed a banner i received (.swf) and followed the steps here but no result...the widget looks empty (I tried again and again and again) but nothing.. I uploaded the swf file in my File manager, I dragged HTML widget, paste the above code and changed the file name with my swf file name, and...nothing..
No problem, we're glad to know you sorted it out. I Cannot upload the flash file in the first place help. How big is your file? Yola free allows file sizes up to 15MB. Perhaps it's too large? Hi Gregory - is the file 0kb on your computer? If so, then there's possibly something wrong with it. Could you please send an email to support@yola.com and attach the file so that we can take a look for you? I am trying to insert an intro page so that the user has the option to skip and go to the home page (www.domain.com for example). Is that possible to do? if so how? if not , then can yola look into implementing this? You may like to go to this thread and put your request to Shawn on this issue?